On the listing worksheet, you can set up access for Master Lock lockbox. Navigate to the ‘Access Information’ section of the listing worksheet. 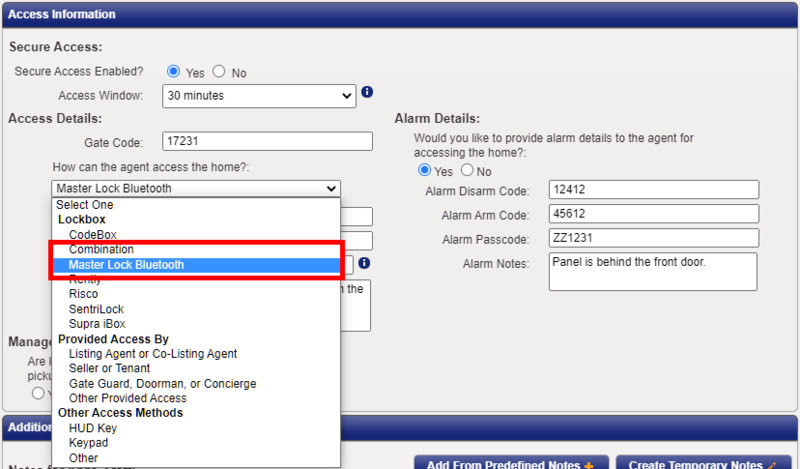 Under ‘Access Details’, select either ‘Combination’ or ‘Master Lock Bluetooth’ from the drop-down menu. Select this option if your Master Lock lockbox model offers Bluetooth technology to allow the showing agent to conveniently open the lockbox using their smartphone. Enter the lockbox Device ID, Location and the Sharing Code. The sharing code is a code provided by Master Lock that is used to activate your lockbox with ShowingTime. Please refer to your Master Lock Vault Enterprise site for additional details on how to obtain this code. If the showing agents choose not to utilize Bluetooth technology, they can also access the property by typing in the access code that can be viewed from the access details page.